Is there any real-world “science” behind R2-D2’s computer interfacing arm? I read the news today about R2-D2 and was fascinated by the robotic arm it had. There’s actually a wikia page for it (SCOMP link) but doesn’t explain much of how it theoretically works. It’s also a bit “weird” since it rotates, given the fact that most devices I know including very old ones like those wide printer cables, are just pins in contact with holes that have pins. So what’s the reasoning behind R2-D2’s SCOMP link design? What’s the inspiration behind the design of that specific arm? Is there hardware in real life that influenced its design? It’s also a bit “weird” since it rotates, given the fact that most devices I know including very old ones like those wide printer cables, are just pins in contact with holes that have pins. You are thinking of this as pure data connection interface—such as a simple data cable connection—but to my mind I see it as a more of a combined communication method where the core connection passes data but the rotating motion of the arm allows R2 to traverse and “dial” different available systems on that connection. As someone who saw “Star Wars” as a 9-year old kid when it was first released in 1977 R2-D2 connecting to a computer that way always reminded me of a plug being inserted into a socket combined with a rotary phone being dialed. While the idea of rotary phones seem like something truly ancient nowadays—such as in this YouTube video where someone describes their rotary phone to be an “antique”—the reality is that in the early-to-mid 1970s when the first “Star Wars” film was being conceived, designed and made, rotary phones were very common. Deployed to the business community initially, the technology quickly spread to the private sector. By 1979, the touch tone phone was the telephone of choice for most users in many parts of the world. 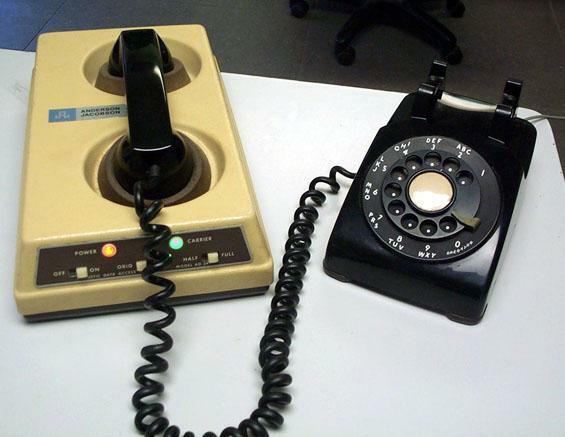 With the deregulation of the telephone industry in the United States in 1984, the touch tone telephone became even more important. This 1979 to 1984 timeframe dovetails nicely with the original “Star Wars” trilogy since “Return of the Jedi” came out in 1983. Meaning that throughout the span of the first three films rotary dial phones were very commonplace in the real world and only became less common after “Ma Bell” was broken up in 1984 and touch tone phones became more and more commonplace in the world. Computer modems with acoustic couplers. Dial on a combination lock. It’s a fairly common TV and movie trope to see some safe-cracker hunched over a lock and listen to the tumblers carefully while he/she attempts to crack open a safe. Just looking at R2-D2’s short—and sometimes visual “hunched”—posture while doing tasks like this, one can easily imagine a visual analogy to safecracker doing his/her safecracking work. Additional in-universe R2 droid arm details for context. …the times he gets electrocuted or shocked by a port and gets sent flying, means it doesn’t lock. 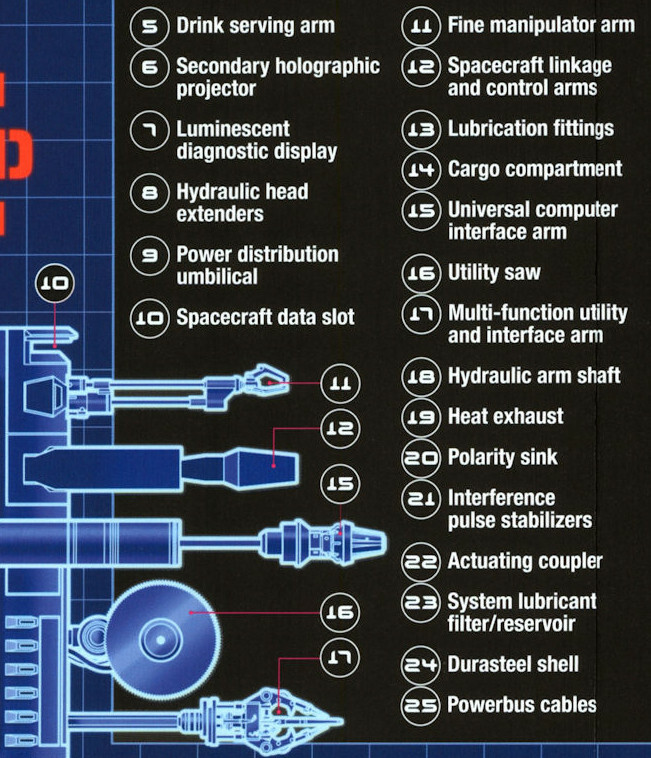 Note that item number 15 is the “Universal computer interface arm” (aka: the SCOMP link) but item 17 is described as the “multi-function utility and interface arm.” In “The Empire Strikes Back” when C-3P0 inadvertently advises R2-D2 to connect to a “computer terminal”—which is actually a power socket—you can see that R2-D2 is clearly not using his SCOMP link arm but rather that “multi-function utility and interface arm” to test the port before doing anything. When he is co-piloting a starfighter through his interface arm, you don't want him to accidentally lose connection during a fight. Well, I’m not too sure that is the case. Looking at the blueprints you see there are a few different “spacecraft” related things such as item 10, the “spacecraft data slot” and item 12 “spacecraft linkage and control arms.” Given the specificity of those names, it seems that when an R2 unit is co-piloting a spacecraft, those connections would come into play rather than the SCOMP link. I always thought it was meant to replicate what the old mainframes did. You'll note the jerk-like motion of the rotating tapes, which is similar to what R2D2's rotoscoping arm did. I guess they were looking for something believable, based on the current technology at that time. Maybe they based this design decision on something like the BNC connector, which needs a quarter turn to fully connect. One advantage for using such a connection is, that it isn't as easily disconnected. Remember that R2D2 is an astromech. When he is co-piloting a starfighter through his interface arm, you don't want him to accidentally lose connection during a fight. It's most like a Torpedo Data Computer's interface with the torpedo. The torpedo's gyro angles were continuously updated with rotating shafts connected to the torpedo while inside the tube. They were constantly in motion in both directions. Is there any reason why mostly technology deprived planets are pictured in the Star Wars movies? Are there any reports that K-2SO will return?